With the recent influx in dog food recalls, I've received several requests from readers and fellow dog lovers to share another of my homemade dog food recipes. 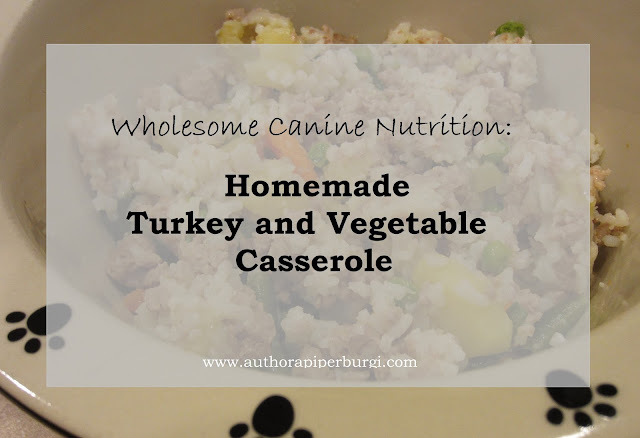 I decided to share my recipe for my puppy-approved Turkey and Vegetable Casserole. I cook it frequently for my current furry friends as often as I've made it for my late epi-warriors, Lana and Darren. Considered second only to a raw food diet by many, homemade dog food can be a healthy alternative to unhealthy commercial kibble. With homemade dog food, you have control over the ingredients, potential allergens, additives, preservatives and nutrition of your dog's fare. Wholesome nutrition can mean a longer, healthier life for your furry friend(s). Making your own dog food is also an excellent opportunity to provide your fur babies with a variety of different meats, fruits, and vegetables which results in a nutrient-dense diet. 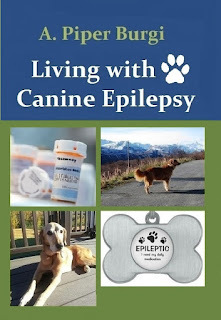 A homemade diet is perfect for canine's suffering from allergies, seizures or other ailments since you have better control over the ingredients your dog ingests. Adding supplements that improve skin and coat condition while feeding foods that do not cause allergic reactions can alleviate symptoms or eliminate allergies completely. You might also notice that your dog(s) smell much better, as that infamous dog odor usually goes away when you feed a clean diet. Homemade diet recipes are composed of both cooked and raw ingredients, such as muscle and organ meat, cooked or pureed vegetables and a moist carrier like plain yogurt, cottage cheese, pumpkin puree or applesauce. A multivitamin is of vital importance to any dog food recipe because it helps to replace nutrients lost during cooking and ensures balanced nutrition. There are several excellent choices commercially available, but when in doubt it is best to consult a nutritionist to help you properly balance your dog's meals. 1. Brown ground turkey with olive oil. 2. Boil peeled and chopped sweet potato, green beans, peas and carrots until tender. 3. In a large bowl, combine sweet potato, green beans, peas, carrots, applesauce and cottage cheese. 4. Add browned ground turkey and mix well. 5. When mixture has cooled down, add vitamins and serve. This recipe also lends itself for make-ahead meals. Simply multiply this recipe to your needs, portion appropriately, and store in plastic containers in refrigerator for up to a week. Just don't forget to re-heat the necessary portions before serving, as ice-cold foods might upset your dog's tummy!